This re-issue is identical to the previously sold-out 2011 La-La Land Release in both packaging and content. (Only variation is “Limited Edition of 2000 Units” is printed on the back cover). Presenting the return of acclaimed composer James Horner’s (STAR TREK II: WRATH OF KAHN, 48 HRS., TITANIC, AVATAR) legendary score to the 1985 Twentieth Century Fox actioner COMMANDO, starring Arnold Schwarzenegger, Rae Dawn Chong and Alyssa Milano and directed by Mark L. Lester. Horner’s propulsive orchestral, steel drum-laced score builds on his 48 HRS. motifs, resulting in the perfect, high-octane accelerator for Schwarzengger’s unstoppable, death-dealing assault. 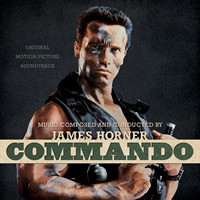 Remastered and expanded with bonus alternate tracks in 2011, our previously sold-out edition of COMMANDO is back! Also featured is the unforgettable end credits rock anthem “Someday, Somehow, Someone’s Going To Pay” (AKA “We Fight For Love”) performed by The Power Station. Produced by Nick Redman, restored by Mike Matessino and mastered by Daniel Hersch, this dynamic release is limited to 2000 Units. Film music writer Jeff Bond provides captivating in-depth liner notes, featuring comments from screenwriter Steven E. de Souza and co-writer/lead vocalist on “Someday, Somehow, Someone’s Going To Pay,” Michael Des Barres. Let’s Party!